This entry gives a brief overview of the college libraries. For more in depth entries on each of the libraries, click on the links below. This bookplate appeared in the library in Chambers Building. It was called Union library to signify the assimilation of the book collections of the college and both student literary societies. The beginnings of a library began in the chapel (350 books in 1841) and the Eumenean and Philanthropic Literary Society Halls in 1837. Although the chapel’s collection was hardly ever used, in addition to the collections of books, the literary societies had budgets for shelving, binding, and purchasing. And, while the college’s library would not have a professional librarian until 1907, each of the literary societies assigned a student to act as a librarian for each collection. The task became formidable enough that student assistants were needed to help (Beaty 47). The first administrative attempt at creating a library for faculty use (the students still used the literary society libraries) came when Reverend William H. Foote donated funds, instead of personally chosen books, to the college for library use. Starting from that point, the Davidson College Board of Trustees assigned the responsibility of maintaining the library to the faculty (Beaty 76). 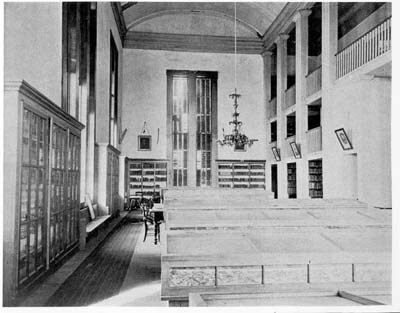 When the original Chambers Building was completed in 1860, a large room on the second floor was dedicated as the library. On July 10, 1861, the trustees established a budget for the library, starting at $500/year (Beaty 77). The literary societies decided that it was a better idea, financially and practically, to have their book collection assimilated into the library in Chambers Building, so in 1887 the students moved their books. The additions to the Chambers collection prompted a new name, the Union Library (“History” 2). To maintain this collection, the trustees hired Davidson College’s first female employee to serve as the full-time Librarian and Registrar on May 28, 1907, Miss Cornelia Shaw (Beaty 208). 9-3450″] As the need for more space grew, Davidson received a $20,000 grant from Andrew Carnegie. After raising money for a library endowment, construction began for a new library, named in Mr. Carnegie’s honor, in 1909. 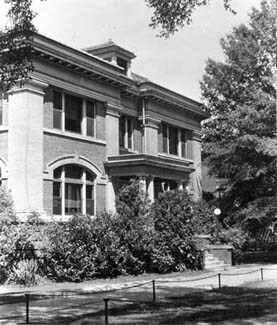 By 1910, the new Carnegie Library stood at the top of the “D” (the original driveway on campus, shaped like a D), where there once was Steward’s Hall, one of the original buildings to Davidson’s campus. Toward the end of the Carnegie Building’s career as the library on campus, a new librarian was appointed. Only the second head of the library in Davidson College’s history, Dr. Chalmers Gaston Davidson, class of 1928, took the post in 1935. He would be director of the library in three different buildings on campus, seeing the collection transfer from Carnegie to Grey library, and then from Grey to E. H. Little library. Again, space became an issue. In 1929, Treasurer “Cash” Jackson went to see Captain James Parks Grey, class of 1885, in Tennessee. He was able to secure $30,000/year for five years from Captain Grey for construction of a new library (Beaty 296). The Grey family was the first family that had four consecutive generations of their family attend Davidson College (“History” 3). 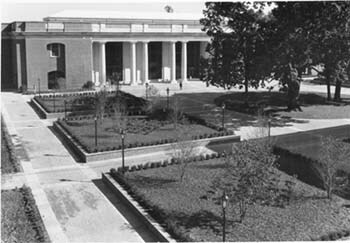 The new library was thus named the Hugh A. and Jane Parks Grey Memorial Library upon completion in 1941. The old Carnegie building did not go to waste though. After brief use as a student social center (Beaty 338), the building was turned into a guesthouse for visitors of the campus, and it stands as thus today. 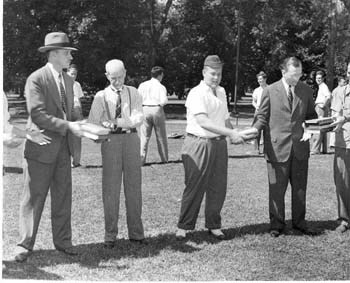 One of the more famous events in Davidson College history was the library “bucket brigade” that formed between Carnegie and Grey libraries in October 1941. Students, staff and faculty formed a human chain from Carnegie across Chambers lawn to the new Grey library. Each person passed a handful of books down the line until all the books were transferred from the old library to the new one. In 1958, a new wing was added to almost double the space in the Grey library. A Rare Book Room was donated by Mr. Alphonso Smith, and it was dedicated May 9, 1964 (“History” 4). Knobloch Campus Center in 2001. In 2002, the building regained part of its library history, when it was remodeled as the Sloan Music Center, containing the Music Library on the first floor. The Music Collection originally was the responsibility of the Music Department. Room was allocated for the collection in the Cunningham Fine Arts Building, when it was built in 1961. Eventually, it became part of the library’s collection and responsibility. The Music Library moved to Sloan in 2002 due to inadequate facilities and the lack of space. When the $4.2 million E. H. Little Library was completed in 1974, it became part of the academic heart of Davidson, as it was right next to Chambers, the main academic building. Dr. Leland M. Park, class of 1963 and the assistant director and head of reference of librarians, who had been integral in the planning of the new library, became director in 1975, at which time, Dr. Davidson moved to upstairs to serve as the college archivist until his death in 1994. The building includes a circulation area, a separate reference desk, the College Archives Office, the Davidsoniana Room, student study rooms, and a 24-hour study room. During his term as director, Dr. Park oversaw the introduction of an electronic cataloguing system called CHAL and the addition of an electronic classroom. In 1966, when discussions began about building a new library, there were 130,000 books in the collection (Beaty 400). By 2005, the collection had grown to over 600,000 books (Park). In September 2005, Dr. Park announced his retirement set for June 2006. In July, Mrs. Sharon Byrd, Head of Public Services and Reference, began serving as Interim Director until Jill Gremmels took over in June of 2007. Beaty, Mary D. A History of Davidson College. Davidson, NC: Briarpatch Press, 1988. “E. H. Little Day is September 27.” Davidson Update September 1974: 1. Hamilton, Lexi. “Legendary Librarian Park Announces Retirement.” Davidson College. The Davidsonian 5 October 2005: 1, 5. Harris, Sherman. “Moving Day: Just Divide 200,000 Books by 12 Miles.” The Charlotte News 13 July 1974: 2B. Hartwell, Randy, “Question of the Week.” Davidsonian. 23 September 1996. 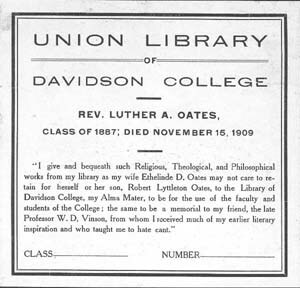 “History of Davidson College Library.” Office of Public Relations. Davidson College. 1974. Park, Leland M. “Library Inventory Report – 2005-05.” E-mail to Staff Distribution List at Davidson College. 27 March 2006. Syme, John. “The Book of Leland.” Davidson Journal Summer 2006: 38-39. Syme, John. “Longtime College Librarian Announces Plans to Retire Next Summer.” 30 September 2005. Davidson College News & Events. Accessed 17 July 2006 <http://www2.davidson.edu/common/templates/news/news_tmp04.asp?newsid=4974>.